Oriental flavours are complemented by a crimson pomegranate sauce in this vibrantly coloured exotic dinner for two. Preheat the oven to 200°C, gas mark 6. 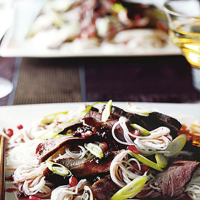 Mix together the Chinese Five Spice, Sichuan pepper and sugar, and rub onto both sides of the duck fillets. Heat the oil in a frying pan and fry the duck fillets over a high heat for 2 minutes each side. Place in a small roasting tin and roast for 15-20 minutes for medium, or 20-25 minutes for well done. Meanwhile, cut the pomegranates in half and scoop out the seeds with a teaspoon, discarding the white pith. Place the seeds in a food processor (reserving a handful to garnish). To extract the juice: blend, then press through a sieve into a medium pan using the back of a spoon. Bring to the boil and simmer for 6-8 minutes to form a syrup. Finally, stir in the redcurrant sauce and simmer for a further 2-3 minutes. Remove the duck from the oven and allow to stand for 5 minutes, then slice thinly. Serve on a bed of noodles, drizzled with the sauce and garnished with the chopped salad onions and the reserved pomegranate seeds. We now sell ready-prepared pomegranate seeds. Find them in the chiller cabinet with the prepared salads.